Fancy a short break away, with the Engadin ski marathon thrown in for good measure at the end of the trip. Have you been roller skiing over the summer, have limited holidays left with work, and still wish to fit in one of most existing cross country ski races held each winter. We will start all lessons with the fundamentals of skating, and we will build on each step of learning to skate to refine your technique. Each lesson we will work on all the techniques required in skating to make you a better skier, you also have the option to classic ski as well, and we will teach the same core elements of classic skiing as we do with skating. Each day the lessons will be broken down into small and simple steps which produce a greater level of progress in classic and skating. The program for the week will be structured to each person's needs, and what they would like to improve on. The morning lesson focuses on technical teaching, with emphasis on correcting faults, or working on the basics of learning to cross country ski, skating or classic. At the end of the day we will go back over the drills that we learnt in the morning to iron out any errors that have crept back during the days ski. For the hour lessons, we will focus on the most critical error that you have and work on this so that you can gain the most from your lesson time. The days leading up to the marathon, we will wax skis, and also ski parts of the course. On the Friday we ski to St Moritz to collect the race bibs and have a look at the trade stands and a great opportunity to test skis from all the major brands. 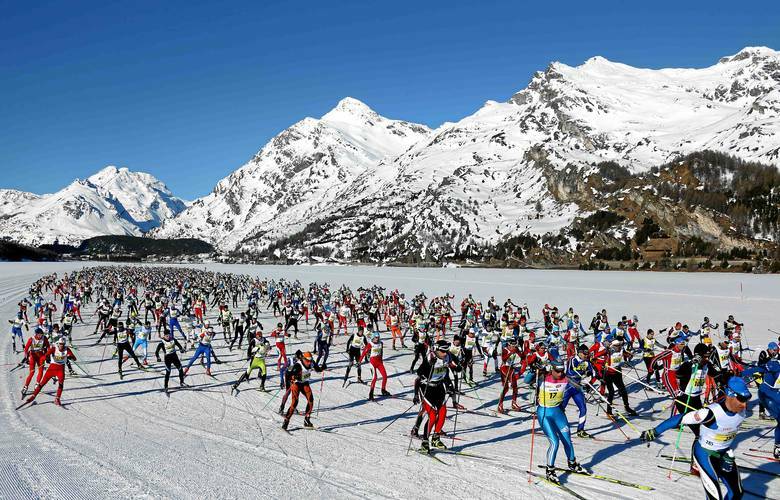 On the Sunday for those who wish can take part in the Engadin ski marathon, this is one of the best first timer's marathons, with a relatively easy course and very wide and open tracks all the way to the finish. This week is for all levels of skier, and we would recommend that some time is taken on roller skis over the summer months to gain some technical level of skiing before the trip. From the UK to Zurich or Innsbruck, A good number of airlines fly from all major airports in the UK to Zurich or Innsbruck, we recommend that you try to book the earliest flight possible and also the last flight back to the UK, this will give plenty of time for transfers into the Engadin valley by the connecting train from Zurich airport. It is also possible to fly into Innsbruck and then take the train to Pontresina, transfer times from Zurich or Innsbruck take about 3 hours. The other option is to travel from London to Paris then onto Zurich via train, then the connecting train service into the Engadin valley. We recommend that you contact the tourist office in Pontresina for a full list of accommodation options,we will also talk to others who have booked onto this trip to see if the group would like to book an apartment for the week. With a good range of accommodation to cater for all budgets and within easy reach of the train station just on the edge of the town. Other options within the town please contact the tourist. Race entry can be done online, with the option for the full marathon distance or the half, entry for the race will close two days before the race.